One of 13 buildings comprising the Scientology religious retreat known as the Flag Land Base in Clearwater, Florida, in the United States. Life has tended to force the individual into certain values. The stresses of existence have tended to fixate his attention to a point where his awareness of himself and his environment has been greatly diminished. Attendant to this lowered awareness are problems, difficulties with others, illness and unhappiness. The goal of Scientology is to reverse this diminishing awareness and, in that sense, wake the individual up. As one becomes more and more alert, his intelligence rises and he is capable of greater understanding and thus better able to handle his life. Scientology, then, contains solutions to the problems of living. Its end result is increased awareness and freedom for the individual and rehabilitation of his basic decency, power and ability. It can and does accomplish these ends routinely, daily, all over the world. Church of Scientology Celebrity Center International in Hollywood, California, leads a worldwide network of Churches that provide religious services to Scientology artists and professionals. Dianetics constituted L. Ron Hubbards first breakthrough, and it was these initial discoveries which led to further researches and the exact isolation of the source of life itself. Man does not have a spirit. He is a spirit. Dianetics addresses and handles the effects of the spirit on the body and thus helps provide relief from unwanted sensations and emotions, accidents, injuries and psychosomatic illnesses (ailments caused or aggravated by mental stress). Scientology, on the other hand, addresses man directly, as a spirit, with the goal of increased awareness and ability as a spiritual being and the full realization of his immortal nature. Scientologists assisted victims of the Kobe, Japan, earthquake. A testament to the truths contained in Scientology lies in the fact that in less than two generations, the movement now flourishes on every continent with thousands of churches, missions and groups touching millions of lives daily. Part of every facet of society, Scientologists are businessmen, housewives, students, artists, celebrities, working people, scholars, soldiers, doctors, policemen and on and on. Church members run community anti-crime campaigns. 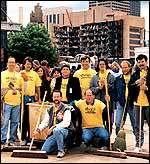 Scientology Volunteer Ministers helped in the aftermath of the Oklahoma bombing in the United States. The dream of making the world a better place has long been embraced by every religious movement in history. Indeed, religion has served as the primary civilizing influence on the planet. 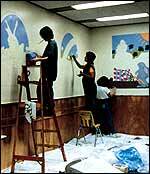 Many Scientology artists volunteer in projects to improve the facilities for foster children. The knowledge that man is a spirit is as old as man himself. Only recently, with the advent of Western psychology, have notions cropped up that man is merely another animal, a stimulus-response mechanism. Such espousals stand at odds to every religious tradition, which variously speak of the soul, the spirit or the life force"to encompass a belief held by all civilized men. Scientologists help fight illiteracy with education projects in inner cities. The Scientology religion follows just this tradition of mans search for his spiritual identity. In Scientology, the individual himself is considered to be the spiritual beinga thetan (pronounced thay´-tn). The term is taken from the Greek symbol or letter theta which has long served as a symbol for thought or spirit. Thus, although a new movement, Scientology is heir to the understanding of thinking men since the beginning of human history that man is a spiritual being who aspires to understand and improve life. The search was long, but it has been successful and answers now exist in Scientology for anyone who wishes to reach for them. Further chapters from the encyclopedic reference book What is Scientology? will appear in the next editions. We welcome your letters with any questions you may have.